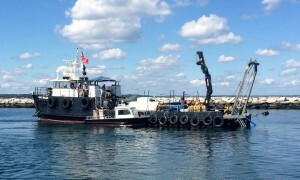 The Naval Undersea Warfare Center, Division Newport (NUWC) upgraded its undersea tracking capability in Narragansett Bay. NUWC installed a new underwater sensor node array to add increased undersea tracking capability and make existing and future NBSWTF operations more efficient. The sensor node array was originally designed to be utilized as a Portable Tracking System (PTS). The array consists of a trunk cable and a hydrophone sensor node array. The trunk cable and array are electrically and optically connected to one another via a connectorized cable termination and panned in a 40x8x8-ft cable pan for a shore-to-sea installation. The cable system is a 8.4 km long array with 12 hydrophone nodes; the nodes are spaced nominally 500 meters apart. The trunk cable is 2.6 km long, and array cable is 5.80 km long. The array is comprised of 12 hydrophones (8 high frequency phones and 4 low frequency phones). The system cable was installed and buried up to 1 meter feet below the seafloor using a Fathom Research diver supported, water jetting system. Ø water temperatures d between 45 and 55 degrees Fahrenheit. 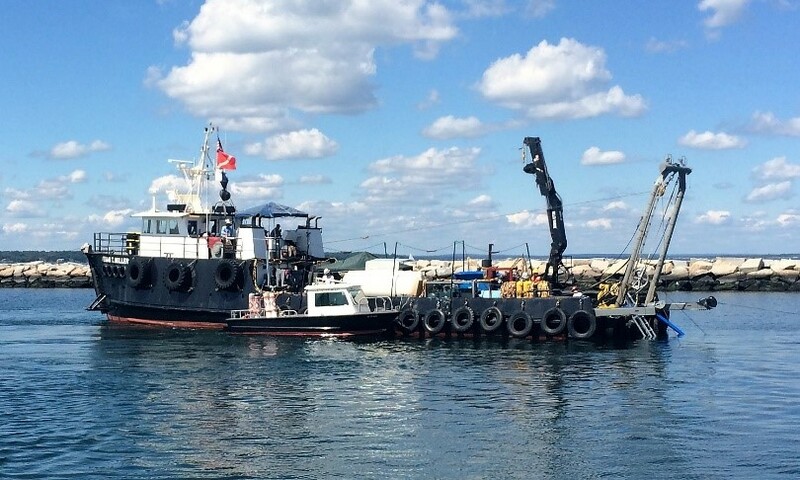 Ø All dive operations occurred onboard the 100-FT cable lay vessel, MV Megan Miller while moored at a minimum 3-point anchor set. 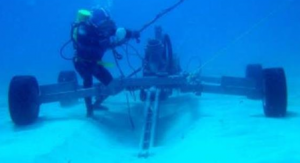 Ø The dive team utilized surface supplied-air, and was equipped with hot water for thermal protection, two-way hardwire communications and closed circuit- TV for topside monitoring. Ø A decompresssion chamber was placed along the port side of the aft work deck and a diver egress ladder will be fabricated to the port-stern of the vessel. Dive support compressors and high-pressure support bottles were located next to the decompression chamber and diver egress point. Ø The dive operations control station, were positioned within the vessel’s cabin, at a designated workstation located within the rear-starboard, deck level cabin. Dive operations consisted of an air control manifold, pneumofathometer gauge, diver communications radio, diver video monitor, and diver-positioning monitor.